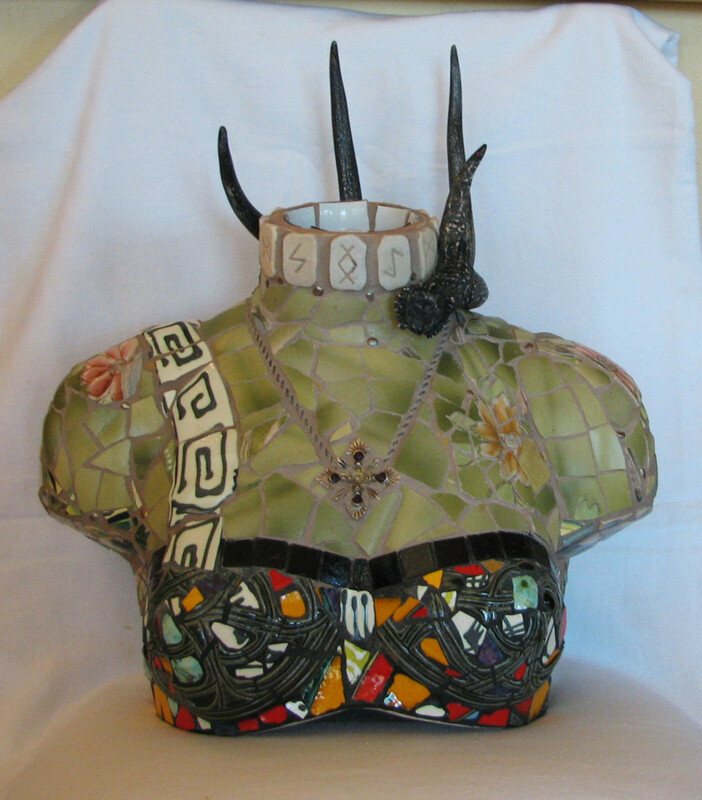 Silva has a technical background and is self-taught in the art of mixed media and mosaic. Her works are scattered all over the world. 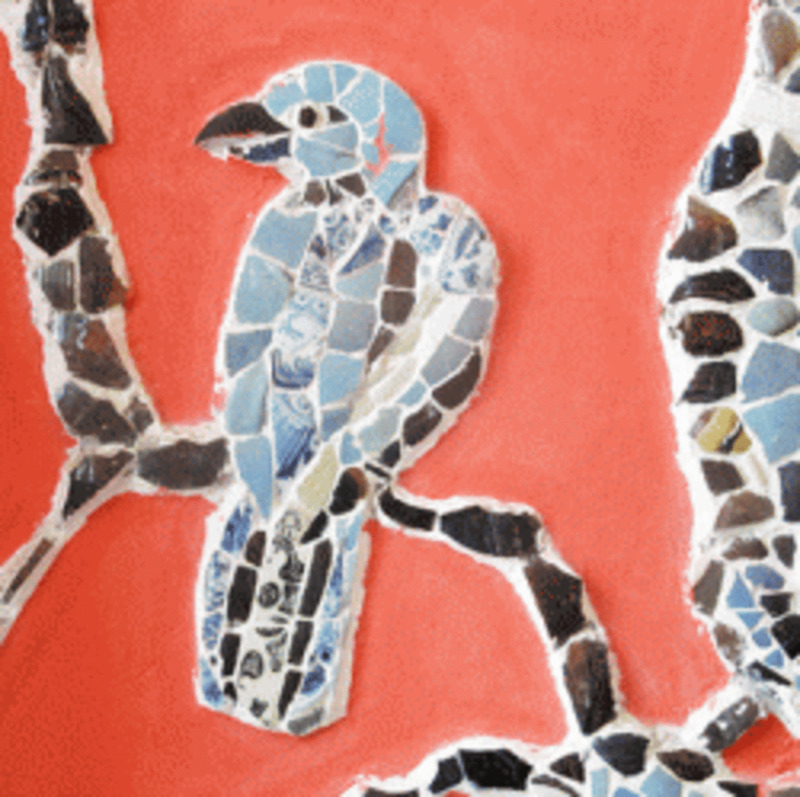 Create mosaic art, a how-to guide . .
Mosaics are colorful. Surprising. Emotional. Evocative. In addition to visual appeal, the mosaic piece must also be appealing to your touch. Each and every bit of tesserae is smoothed or ground in some way; no sharp edges! I use a hand-held carborundum stone or sometimes tumble the stained glass in a rock tumbler. 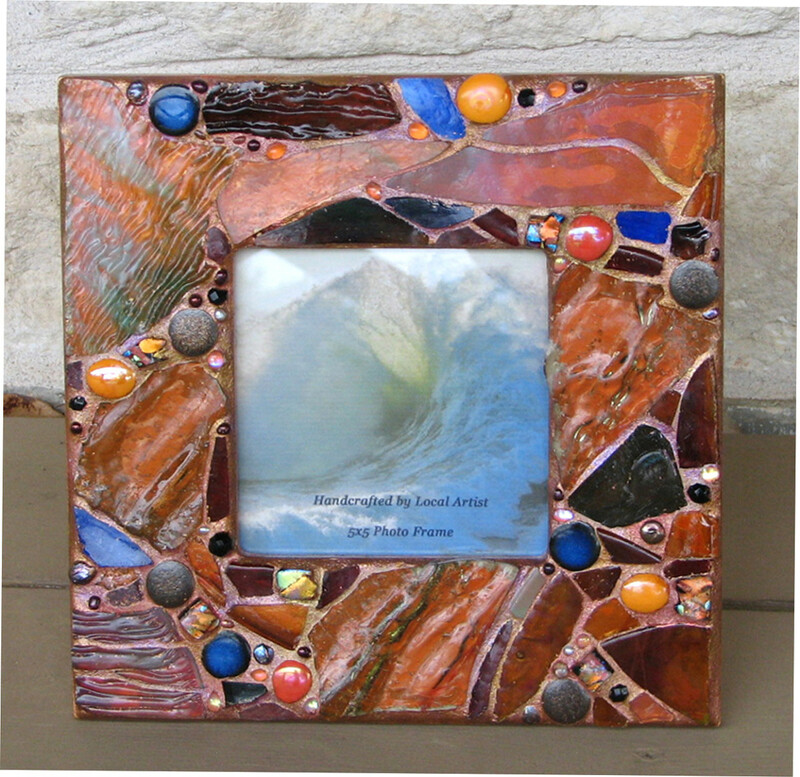 The frame pictured is made up of several different levels of tesserae, but when you run your hand over it, it is completely smooth. If the mosaic is a horizontal surface, such as a table or stepping stone, I want you to be able to set your glass down without it wobbling and I want you to walk over the mosaic without tripping or cutting your bare feet. So my picture frames and wall hangings might have lots of different levels of tesserae, but my table tops and stepping stones will be flat. I want my work to last. The substrate must be suitable for the mosaic. The right adhesive must be used. I've learned a lot by trial-and-error and done plenty of research on the subject of indoor and outdoor mosaics. I recommend that you start with a flat piece such as a picture frame and then move on to 3 dimensional objects. After you decide on your design or imagery and the materials, you will then think about the background of your design. The technique of the way you will lay your background tile is called opus. This means the way you surround your imagery with a more neutral tile. Opus tessellatum means that you surround your image(s) with one or two bands of background tile. Opus vermiculatum is where the tile resembles curved lines and gives a sense of movement to the background. My favorite, Opus palladianum, is random, haphazard, and asymmetrical, and is actually quite challenging as it requires a lot of vision and hard work to fit the pieces together in a pleasing manner. Andamento is where the tiles flow in directions, giving a sense of movement to the background as well as rhythm and flow. Substrate: For indoor projects, use wood, terracotta, glass, etc., almost anything except flexible plastic. The substrate must be rigid. If it flexes, the grout will crack. For outdoors, do NOT use wood. Wood will eventually warp no matter how well it is sealed. It swells, expands and contracts. Use hardibacker, wedi board, cement backer board, glass, Plexiglass, or concrete instead. Some terracotta will hold up well for years, and other terracotta will not; this might be due to different clays and firing methods. MDF is porous so if you use it, seal it very well. I prefer not to use this substrate. Tesserae: Ceramic tile, vitreous glass tile, stained glass, smalti, broken china and pottery, glass beads, shells, pebbles, and jewelry. Avoid wooden beads and organic beads such as those made from beans or pods UNLESS they are well sealed. Decide on colors and theme and then select your tesserae with those guidelines in mind. The picture frame I show here was first painted a bright orange. The stained glass I used is also orange but it is semi-transparent. So the orange substrate intensifies the color. I like using a mixture of large and small pieces; I think it adds interest. If you look at a color wheel, you will see that orange and blue complement each other; they are opposite on the color wheel. The blues are placed in a random fashion, yet the placement is calculated. A piece that is located high up on the left is balanced by a similar piece that is low down on the right, and so forth. A good way to check your design is to stand back ever so often and take a critical look. I used a few glass globs (flattened marbles) because I think they add something to a mosaic, but I keep them to a minimum. There are only five on this frame. I used flat round tiles, a total of seven. Odd numbers are more interesting than even. The challenge here is to use only odd amounts of tesserae and yet produce a balanced and pleasing piece. Please note the use of dichroic glass. It is fascinating and full of fire, like an opal. I love dichroic glass, and again, I use it sparingly, because 1) too much is over-powering, and 2) it is extremely expensive. Many people have the notion that, if you use dinner plates or tiles for tesserae, you should just put them in a towel and smash them with a hammer. I prefer to use a tool, called wheeled nippers, and cut the pieces in the shape that will work best for me. I don't recommend smashing plates with a hammer. Adhesives: For indoor projects, use Weldbond water-based glue (except mirror tiles) or MAC glue. Do not use Weldbond for outdoor projects. 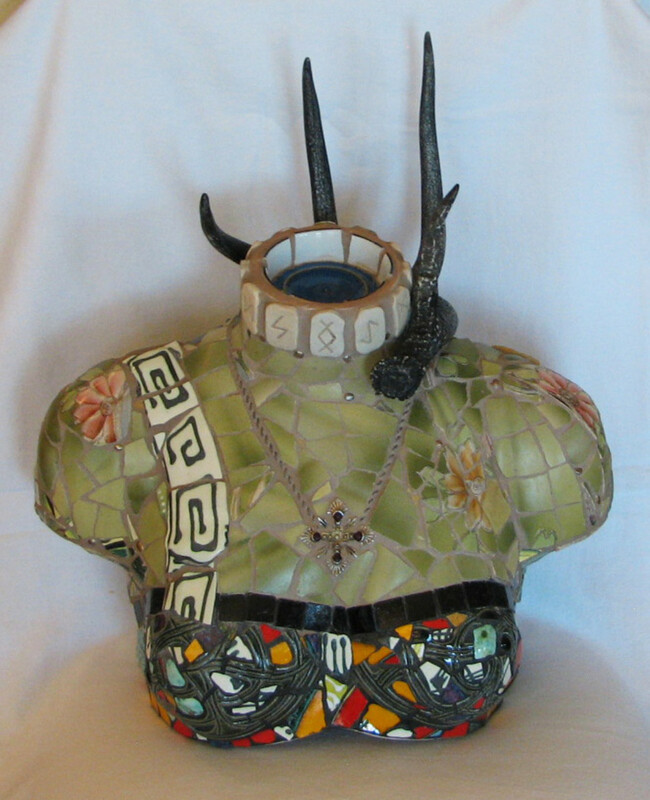 When wet, Weldbond may revert to its liquid state and release the tesserae. For mirror tiles, I use GE Silicone II Kitchen and Bath clear sealant. High solvent adhesives can damage the mirror backing. I recently read that the pros almost exclusively use "Mirror Mastic." It seals and protects the mirror backing. You need a calking gun for the tube. Seal the tip well between use. It works well, but is messy (sticky). I have not used it myself. For outdoor projects use Mapei brand Ultra Flex 2 polymer modified mortar (this is a thinset that can be used as an adhesive and as a grout). I have also used the GE Silicone II on outdoor projects and so far it is holding up well. For glass on glass, use MAC Glue, available only online. One place that carries it is Maryland Mosaics . Grout: Polyblend sanded grout mixed with water, or other sanded grout that does not contain a polyblend mixed with Acrylic Mortar Admix instead of water. I do not recommend unsanded grout or premixed grout . Do not breathe in the powdered grout -- it can damage your lungs! Sealants: For indoor projects, use Aqua Mix Grout Sealer or DuPont Grout Sealer. Brush on, polish off the tesserae. For outdoor projects, use Aqua Mix UltraSeal Premium Stone & Tile Sealer or DuPont Grout Sealer. Spray on, polish off the tesserae. 1. Glue on tesserae. Wait 24 hours. 2. Grout. Clean tesserae. Wait 24 hours. 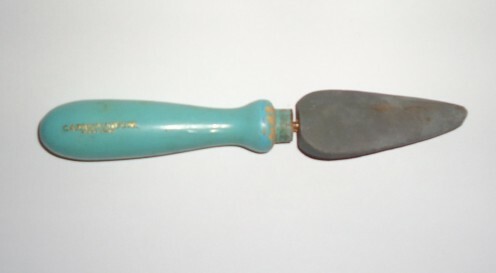 Tile nippers. The best are the wheeled Leponitt nippers. Toyo pistol grip glass cutter for cutting straight lines in stained glass. 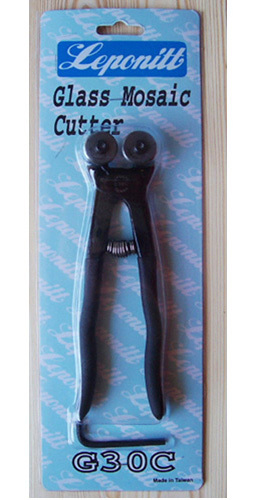 Small wire cutters for removing the pins from the backs of jewelry. Carborundum stone. This may be called a kitchen sharpener. Look for one with a handle. Use to take the sharp edge off of glass or broken plates. Sponges, rectangular, to wipe the grout off the tesserae. Old terry cloth rags, craft sticks, plastic bins for mixing grout and for water. Gloves. Blue painter’s tape. A ring saw or other wet tile saw is nice to have, as is a glass grinder, but these tools are not must-haves. I recently learned how to mark a pattern on stained glass (or tile) that I am cutting with my Taurus 3 ring saw (a wet saw made especially for stained glass work). I am pleased to pass on a solution to your pattern washing off as you cut. DecoColor Opaque Paint Markers come in every color and in broad line and fine line and the lines will stand up to the water from the ring saw. They're the kind of marker that you press the tip to a piece of paper to get the paint flowing. To remove the marks from the glass, alcohol won't work but I can scrape it off with an old dull-bladed knife, or I can easily sand it off with one swipe of a 3M fine sanding pad. Direct – glue tesserae directly onto the substrate. Tesserae can also be glued to mesh and then transported elsewhere and affixed, to a wall or a fireplace surround, for example. Indirect – lay tesserae upside down in a mold coated with Vaseline or mold release, and pour cement, as for a stepping stone, or glue tesserae upside down onto brown Kraft paper. The indirect method is usually used when a smooth surface is required, or when mosaics are made in a studio and then transported elsewhere for installation. The tesserae MUST be flat. Mesh - You can mosaic onto mesh, and then peel the mosaic up and transport it elsewhere for installation. First select a large flat surface such as an old cutting board. Cover it with a cellophane wrap-type substance such as a large baggie, trimmed and opened up so that it is one flat layer. Tape the baggie to the cutting board all the way around the edges. Lay down a piece of mesh. Now mosaic onto the mesh, using a Weldbond-type glue sparingly. You want to use just enough glue to attach the tesserae to the mesh, but still leave gaps for later glueing. Wait until the glue is set up and then slowly and carefully peel the mosaic up off of the cellophane-covered cutting board. Trim any excess mesh. Lay flat and upside-down to dry. Here is an example of using this method. I was commissioned to mosaic a large fireplace surround. I mosaiced many 12 inch squares onto mesh, dried thoroughly, and then stacked them up and transported them to the job site. I glued them to the surface, held and pressed for a few minutes, and then used a strip of blue painter's tape to attach them temporarily. Every few minutes I would go back and press until they were firmly attached. When working with a random pattern, leave the edges of each mesh square irregular, and install them an inch or so apart. Then fill in the gaps. This saves hours of work and especially saves time and effort when working on a vertical surface. After gluing, wait 24 hours and then grout. Selecting a color is extremely important. My favorite color is a soft pale brown. Another favorite is black. Least favorite is white. Carefully shake some dry grout onto your piece and into the grout lines to see if the color works for you. Mix the grout with water or admix or a mixture of both. Mix in a disposable container. Do not breathe in the grout dust . Mix to a consistency of peanut butter. Wait up to ten minutes (this is called slaking) and then spread with a tool or popsicle stick, or with your gloved hand. Make sure the grout fills in every nook and cranny. Note: Never wash any grout down your drains . It will ruin your plumbing. I grout outdoors when possible, but when I do grout indoors, I go outside to dump the water that I dip my sponges in. Wait a moment or two and then gently begin to remove the grout from the tesserae. At first use your gloved fingers and then a dry paper towel. After removing the excess, gently pass over the mosaic with a damp sponge (not a dripping wet sponge). Your goal is to remove the grout from the surface of the tesserae but you do not want to dish out the grout lines; you want them to remain smooth and level with the edges of the tesserae. At this point, you can pat the grout with a sponge or your finger and you can smooth a problem area with a wet makeup brush. Continue to wipe with a damp sponge; rinse your sponges in a bucket of water between each use. Wash your sponges out thoroughly when you are through with this process. Throw the water away outside and refill your bucket with fresh water until your sponges are completely rinsed out. Allow the grout to firm up (about 30 minutes) and then carefully wipe the haze off the tesserae. When you are certain that the grout won’t be disturbed, you can firmly polish the mosaic with a wet washcloth, wrung out well. Grout failure: If too much water is used to mix the grout, it might fail because it's weak. Another possibility is that the dry ingredients separated and settled within the bag and the proper proportions weren't mixed. The way to make sure this doesn't happen is to mix the entire bag of grout while it's dry before you scoop some out to mix with water. I know this is not a pleasant thing to do. I buy the smaller bags of grout so it's less trouble, and then you can dump the entire bag into a bucket, stir it up (dry), and then scoop out what you need for your mixture. I do this outside. Take care not to breathe it. Allow to sit undisturbed for 24 hours (or longer), then seal. The sealer has the consistency of water. Apply all over the piece, making sure that the edges are well sealed. Immediately polish the sealer off the tesserae. Please check out my blog: . I talk about projects I've done and included pictures. Some of my projects are the stair risers in my home, a glass-on-glass totem, and several guitars. I often paint the grout. On the frame pictured above, I used copper metallic. I seal the grout first, then paint with acrylic paints. I use a natural sea sponge (also called a silk sponge or a cosmetic sponge) to apply the paint. Wet the sponge first and squeeze dry, then squirt out some paint into a lid, then dab the sponge in the paint, then randomly sponge all over the mosaic. Wipe off the tesserae with a damp cloth. I like to use more than one color of paint. Just remember to wash your sponge often because the acrylic paint drys quickly. If you want a shiny finish, you can shellack the entire piece. I use Liquitex Gloss Varnish. I buy both the varnish and the acrylic paint at Michael's or Hobby Lobby. Where to find mosaic tesserae? 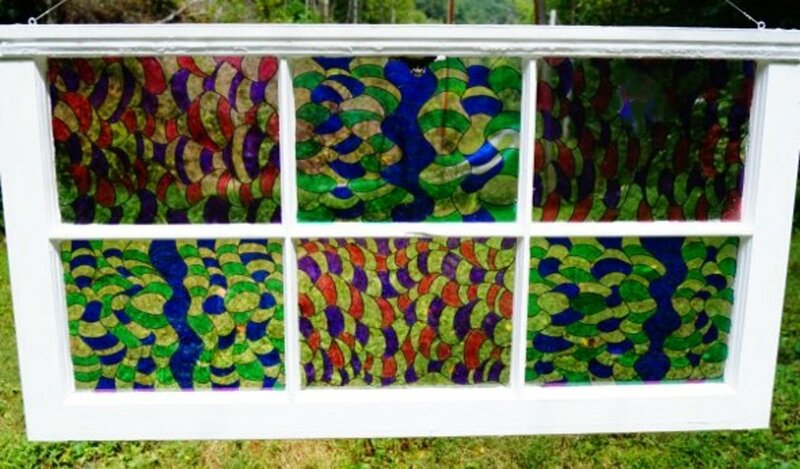 Stained glass can be purchased in sheets from stained glass stores, hobby shops, and on-line. Did you know that most stained glass shops keep bins of scrap glass which is very economical and perfect for mosaicing. Scrap glass is sold on eBay also. Plates and old bits of costume jewelry can be found at thrift shops and garage sales. 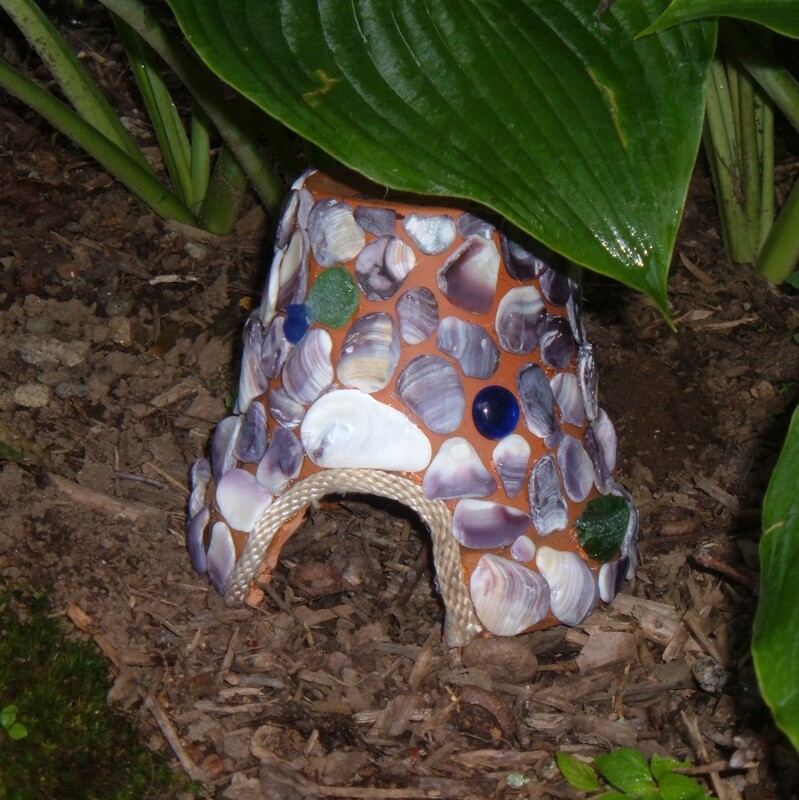 Go here to read about how I used curved bits of porcelain and discarded costume jewelry to create a charming little gazing orb: http://hubpages.com/hub/How-to-mosaic-a-styrofoam-ball. A local tile shop here has a "tile graveyard" outside where you can pick through and take what you need for a small amount of money. I have been told that some tile showrooms just throw away their displays and samples when they change out their displays. 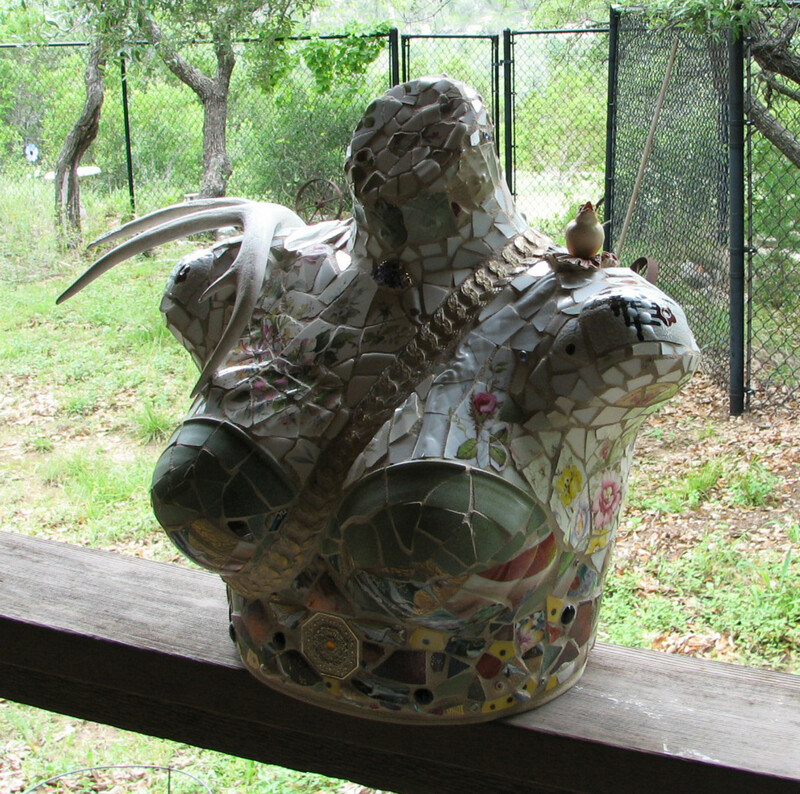 And finally, once you get involved in mosaics, you will want to join discussion boards on line. One lady in Michigan posted photos of some old plates that she found for practically nothing at a garage sale. They were my favorite much-sought-after discontinued pattern. We worked out a trade. That same discussion group has two or three exchanges each year where names are drawn and USPS large flat rate priority mail boxes full of goodies are exchanged. 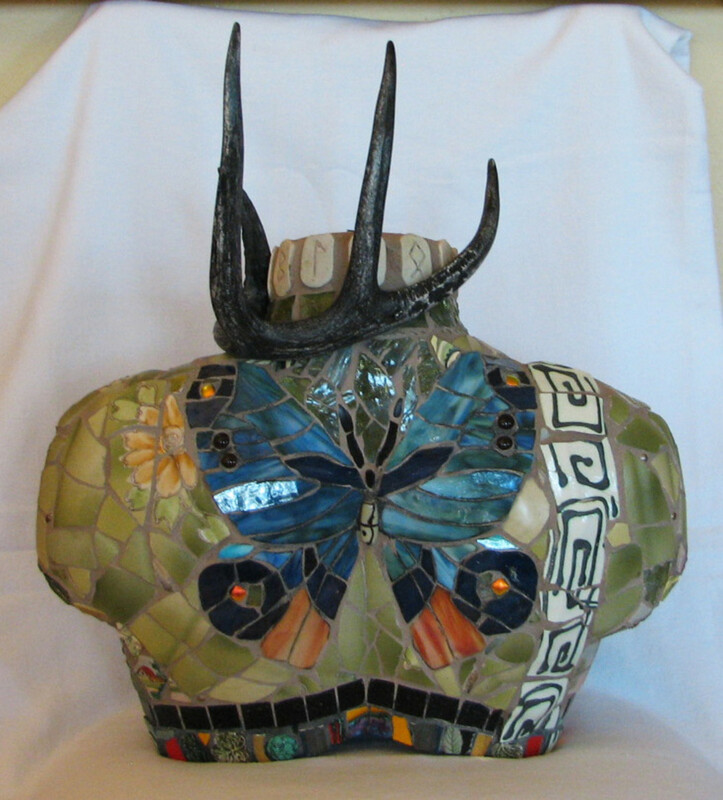 I just today, November 22, 2011, added some organizing tips for mosaic artists at the end of my hub, http://silvahayes.hubpages.com/hub/StartProjectToday. This is a lesson learned after clearing up and organizing ten year's worth of bins of leftover tiles, bits of costume jewelry, stones, marbles, broken plates, etc. Mosaic art -- have fun with it, beautify your surroundings, inspire others, leave something beautiful behind for future generations to enjoy, recycle, make friends with mosaic artists all over the world -- check out groups on Facebook -- it's all good. Thanks so much for this very useful guide. I've been trying to get into mosaics and so much of the information I have found has been incomplete. Of particular use was the detailed specifications of the glues and sealants and grouts, with specific products to look for. So much other information omitted this, especially the detail of what glue to use for mirror fragments to not degrade the silver backing. Now I have a shopping list. This is a great resource. Thanks! Sometimes I tumble small pieces of glass in a jar, with a small amount of water, for as little as 30 minutes. This takes off enough of the sharp edges so that they don't cut when touched. Just fill the jar about 1/3 full of glass pieces, cover with water, and twist and turn the jar by hand. Try this and see how it works for you. Hi! Thanks for a great article...very informative! And I love your work! I'm newly retired, and finally starting to learn the beautiful art of mosaics. In your article you mention that you file every edge on every piece of glass or tile. What about very small pieces of glass? I have done a couple of projects where there are many small triangles of glass. Is it possible to file them? I'd love my finished projects to be smooth to the touch, as you do. Thanks for dropping by, DealForALiving. You might enjoy it, you never know. It's like painting with pieces of glass or china. So rewarding. Those are some really stunning pieces you've included in this hub. I wouldn't dare try this as I'm not that artistic, but I enjoy reading about it. Thank you, FlourishAnyway for the visit and comments. I am always happy to answer questions if I can. People email me all the time, (silvahayesATgmail.com) about what adhesives to use, whether something's appropriate for outdoors, where to buy materials, etc. So let me know if I can help you if you decide to try this. Warning: extremely addictive. Haha. There are several groups on Facebook that are so welcoming and helpful. This is so thorough. I have always wanted to try this but did not know exactly where to start. Your creative pieces are beautiful examples of what is possible. Voted up and more. Thank you so much, mary615, for your comment and votes. I love doing mosaic art and I guess it shows. I've been contributing to public works lately in Florida and in Germany and will be writing a hub on that after they're installed and photographed. Your work is absolutely beautiful! I've done some mosiacs, but nothing like this! Idid a small table top that turned out fairly well. You wrote a wonderful Hub with great photos and instructions. Aw thanks! I sincerely appreciate it. I look forward to coming back here to your well written piece for pointers on mosaic, so well fleshed out! Hi, Ben, yes, it's my own. I just went and looked at your work; it's amazing! "Artemis at Night" is gorgeous, is it your own Silva? I would like to own an original Hayes but unsure if my budget would match? Anyway, beautiful. I believe I read this article just before I won my first major art competition in Stevens Point Wisconsin's sculpture park. 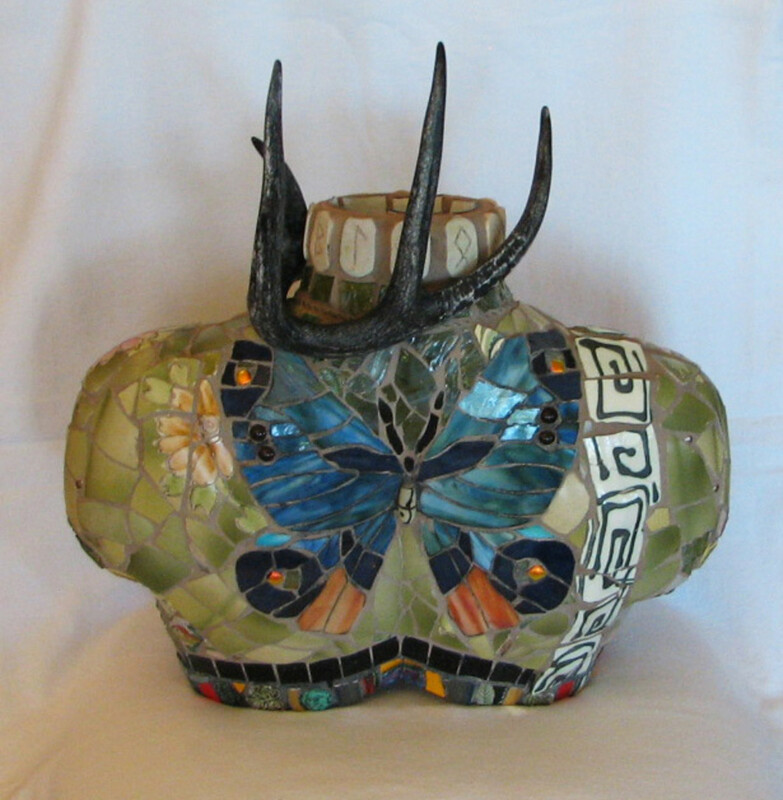 I used tesserae of all sorts to finish my sculpture Swift Nesting Wing. Thanks again, I'm going to share your essay to my Facebook artist's page. I have used either Weldbond glue or MAC glue on wooden crosses. What kind of glue do I use on mosaic wooden crosses? Silicone like rubber??? Thank you so much for your visit and comments, CharronsChatter! Mosaic art is my passion! I hope you give it a try. Wow. My hat is OFF to you, Silvia. 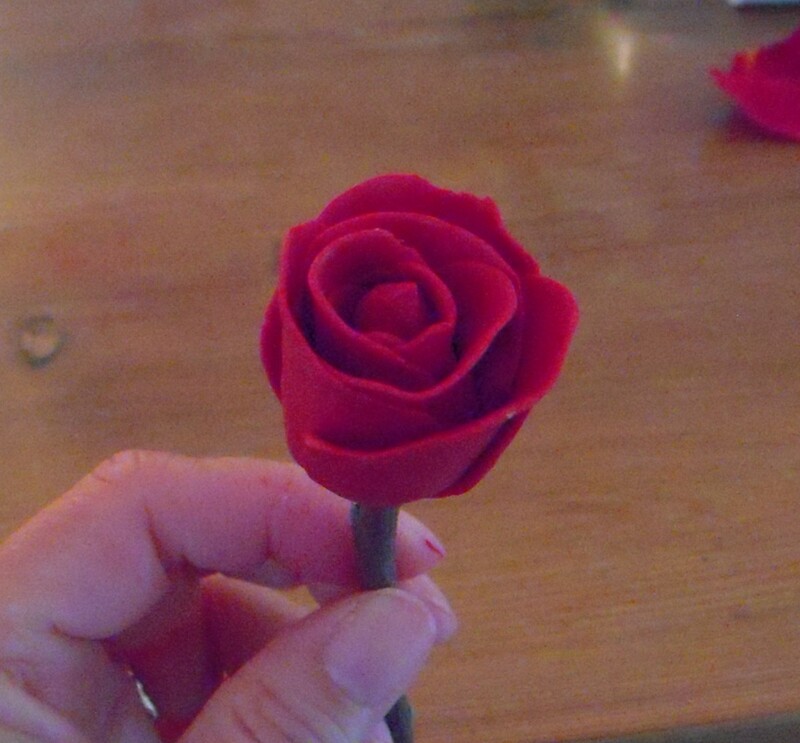 IThe intricacies of your craft are amazing! And so well explained, I bet even my two left hands might be able to mosaic. That bust of Artemis is just great. I am inspired! It's difficult for me to say since I live in the US and am not familiar with that product. I just know that from my experience I will only use sanded grout and would not use a pre-mixed grout. 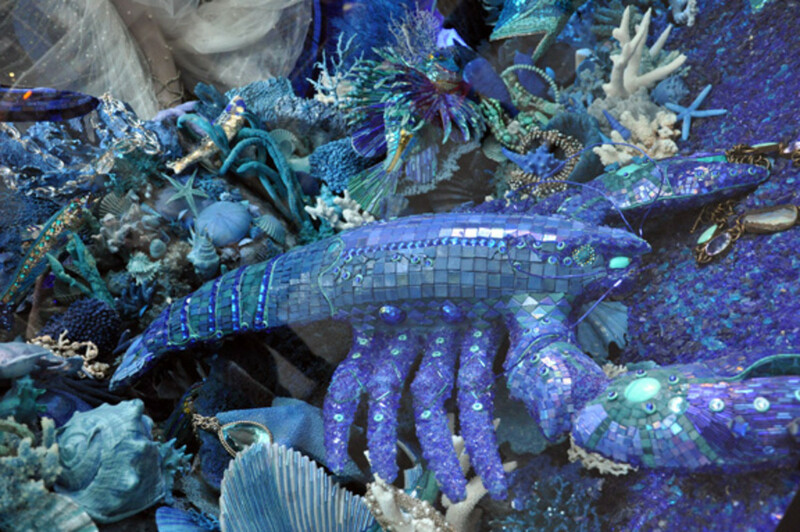 There is a mosaic artist named Anna Tillson in the UK and I wonder if she could help answer your questions. Here is her contact information. I have ordered the adhesive and sealant as you have suggested in your hub but am struggling to know whether the general tile grout in diy stores is appropriate. I have found a unibond black wall tile grout triple protection on www.diy.com - do you think this would be ok? It doesn't say if it is sanded or not. I also found another which is more expensive but the postage is nearly as much as the grout on www.mosaicheaven.co.uk which do you think is ok? I would carefully check the ones that are still on, and if they are secure and tightly adhered to the lamp, I would not take them all off. I would replace the tiles as needed, and then I would re-grout the entire item. I am going to say that 1 kg bag would be enough but I'm not sure what size a beach ball is. I am going to say that if it's small, like a volley ball, 1 kg is probably enough but if it's one of those large beach balls, you might need 2 kg. Is grout fairly inexpensive where you live? It is here. Good luck on this project! Hi, Eddy. Lovely to see you here. Thanks so much for your kind words. We did have a great Christmas and I hope you did too. What a wonderful hub;interesting and useful!!! I shall vote up/across and share all around. I hope you had a great Christmas and are looking forward to the New Year. Good comment, myawn. Hope it goes well. Come back and let us know. I learned a lot from this hub. Now I want to try mosaic tile . I will start with a picture frame. Very good hub! Thanks, Wesley, I appreciate it. Great hub. Pinned and Shared with my followers. Saema, I don't know what happened here; I must have been sidetracked after clicking on your comment. Sorry it took so long to respond! No, I don't think you need to seal the crystals before grouting. Wonderful article...very informative and I love your work! I had a question for you. I am using Swarovski crystals in my mosaic piece along with glass tiles. Do you think I should seal the crystals first before I begin grouting the piece? If so, which type of sealant would you recommend? Thanks for the visit and the comment, tenthingz. Great resource. I've made some mosaics but let so much time go between projects that I need a refresher. Thanks. Winkelmans are such quality tiles, high-fired twice, I think; they should be waterproof all the way through. I have not used them (yet) although I plan to try some. Oh, and the ceramic tiles are Winkelmans unglazed, and they claim to be waterproof and weatherproof too, so will the cut edges also be waterproof? Thanks very much for your quick reply and advice. I'll have a look and see if I can find those sealing products in the UK. I'm using thinset for the adhesive so it should be waterproof. No need to grout your work. However, if it were mine, I would seal it with a penetrating sealer by TileLab or AquaMix. Here's why -- the broken edges of the ceramic tile are open and porous, and moisture can enter and creep under the glaze and cause cracking. Using a penetrating sealer made for stone and porous tile might help to prevent that. It is easy to apply; pour it into a spray bottle, spray the entire surface liberally, then wipe the surface clean with a damp terry cloth rag. Pour the remainder back into the original container. I also understand from researching other people's work that the general opinion is that wediboard edges must be sealed also. People usually mix up a slurry of thinset (mortar) and cover the cut edges, then when it dries you can sand it smooth. What are you using for adhesive? Most people advise using thinset for the adhesive for outdoor projects on wedi, but there are other glues that also work for outdoors. Many advise against using Weldbond for outdoors. 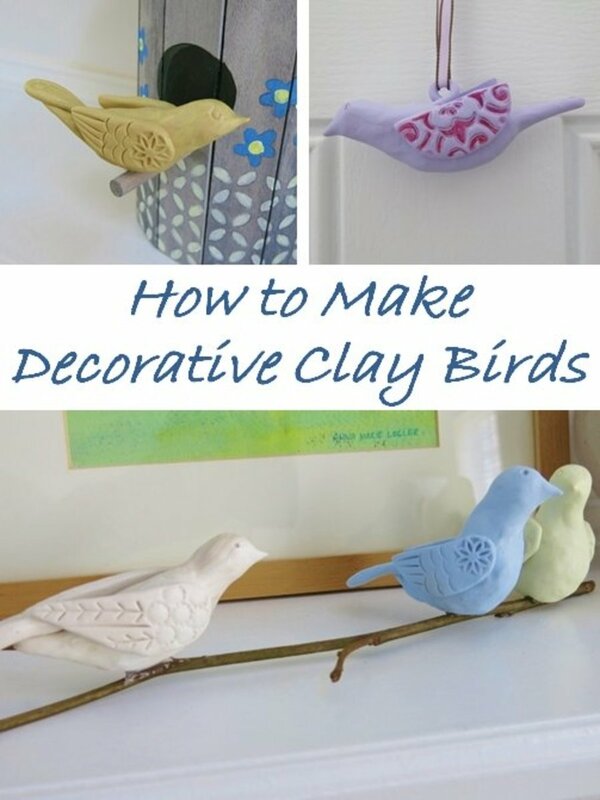 Wonderfully informative and interesting article - thank you :) I'm a very new mosaicist and am making an owl for outside display on wediboard with ceramic tiles. Do I need to grout my work? I really like the texture of the tiny gaps between the tessarae and think the grout may smooth it too much. I have been saving broken dishes to try a mosaic project. Happy I ran across your hub. Lots of great info. To anyone who's interested: I posted pictures of the work in progress on the above-mentioned sign on my blog: http://www.mosaicroad.blogspot.com. You can see the sign as it progressed, plus if you scroll down you can see a variety of mosaics and how they were made. If you have ANY questions, let me know. Just post a comment here and I will respond. wow! Finally a site that explains it all! I've been trying to start an outdoor piece for months, but had a hard time finding which board, etc to use. Thanks so much. This is a wonderful hub. I wanted to start to do mosaics and this article is so helpful. Thank you. My mother used to do stained glass, so she has a lot of the tools already. Thanks again. very useful article, I've made a table top in a class I took. I am making two more not sure if they are going to be tables or not thought. There are two that I use, Aqua Mix penetrating sealer, indoor/outdoor no sheen, and TileLab gloss sealer & finish for indoor use only. I buy them at a large hardware store here called Lowes. Thank you so much, this is my first go at it, so i'm sure i'll have a lot of questions. haha. PS thanks for getting back to me real quick. PPS Oh I just reread ur answer what sealer do u use? I'm from Australia so i'll need to find it here I guess. Hi, Sandra, yes, I glue straight onto the guitar. Then I wait 24 hours and I grout. Then after another 24 hours, I seal the grout. If you like the way it looks, then it's not necessary to varnish. After sealing the grout you are done. If you want it to look shiny, then you can varnish. I like to use Liquitex gloss varnish; I buy it at Michaels. If you think of more questions, just ask. Have fun with the guitar. Hi I'm about to do a Guitar for my daughter. just a few questions do u place them straight onto the guitar and what sort of varnish do u use on the grout and why? kira, I love your comment! Any time I can contribute to someone's inspiration to create art, I am happy! Thank you so much, and I would love it if you came back to describe your progress. I predict you will become addicted to mosaics. Wow! I'm from south africa and have just started mosaicking. I found my moms old guitar in a very sad condition. You've given me such inspiration,cant wait to start! This is easy to do but may be difficult to explain. I will use a 3 ft. x 3 ft. scene as an example but the same principle can be expanded as needed. I would set up a card table, draw out my design on a large piece of paper and and tape it securely to the table top. Then cover that with clear plastic. You can split open large Ziplock bags and tape them together to make one large piece. Lay that over the paper design and tape it down securely on the edges. Now lay your mesh over all. A continuous roll of mesh would be good to use, but let's make it a little more difficult and say that all you have are the 12 inch by 12 inch squares. When you lay out the mesh, overlap the squares by one-half inch and dot the edges with glue (such as Weldbond). The mesh effectively becomes one large piece of mesh. Now you can see your design (on paper) through the mesh and the plastic. Begin gluing your tesserae, applying enough glue to secure it to the mesh, but still allowing gaps so that when you glue your mesh pieces to your substrate, there will be spaces where the glue will contact the tesserae and the substrate. Wait until the glue dries and then carefully peel up your 3 ft x 3 ft design from the plastic. Let's say that your design consists of large leaves and flowers. With a sharp scissors, begin to carefully trim pieces, following your design. Your pieces should resemble a jigsaw puzzle. You can lay out large sections and stack one section on top of another and transport it that way to the destination. The key to this method is that you don't have sharply defined square edges; rather, you have curved organic shapes that fit seamlessly together when you apply the design to your substrate. You could expand this method to even larger installations as long as you are careful to keep the pieces in order. Joan, I hope this is clear, and if you have questions, please let me know. I have used this method and it works, so if you run into any problems, I can help you solve them or put you in touch with someone who can. Have fun. How do I do a huge mosaic on mesh. I dont have the space to do it all on one piece of mesh and need to do panels, but the picture is a nature scene and cant be broken up into squares? Hoping for some help. Cool beans I will check it out Silva! Wow Silva you have won my heart! I was looking for a great mosaic article and you have written it. I read two other poorly written articles first I might add. As a (now decades long) oil painter I have been longing to jump into a new medium, in part to grow as an artist and in part to seek out a new kind of art buyer/commissioner. Mosaic seems like the best and most logical/spiritual choice for me as a creative. Can't wait to give your techniques and observations a try! I have access to a lot of wine bottles, can I just smash them somewhere and use those bits? Also, I'm thinking of doing a fountain project with tile/glass/grout that will be constantly wet? Any suggestions? I'm going to be back here rereading this hub again I'm sure. Well done kudos for you Silva! I have mixed acrylic paint with grout along with the water and haven't had a problem. If it's an outdoor piece, the color will fade over time, but for an indoor piece it should last. You can mosaic directly onto styrofoam. I have another article on here about mosaicing a styrofoam ball. Thank you for visiting! I a 'beginner'..and wanting to color my grout I used an acrylic opaque paint and mixed it directly into the grout & water..I got a great color with a little sparkle. I then read this was not a good idea..but it didn't say why?? Can you tell me? 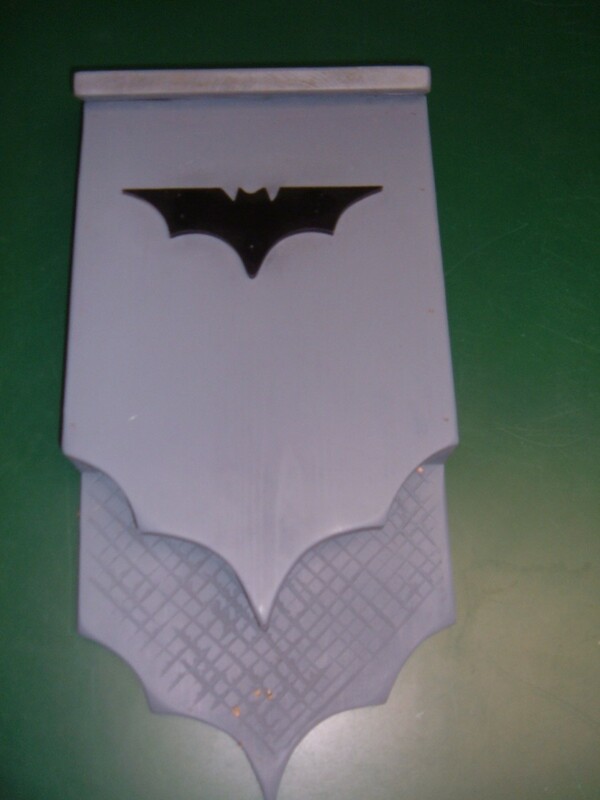 Also, can I mosaic directly on to styrofoam or do I have to put thinset on the foam? Thanks, love your work! Great tutorial! I have some ideas that have been rolling around my head for a long time. Thanks for the encouragement to produce them! 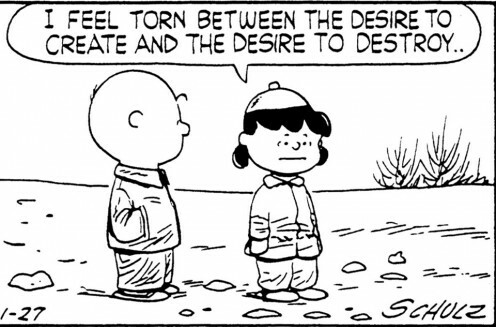 Oh yeah, you will be hooked for life. Just break a plate, dig into your old costume jewelry, and maybe include some rocks from your driveway. It's addictive! Thanks for reading, Hendrika. Wow! Now you have completely intimidated me! I dabble in mosaics a little, but I keep to the little tiles I buy in a crafts shop. I will have to get a little more inventive. Thanks, DRobinson63. My daughter and I have a mosaic studio and we ordered that type of frame in large quantities, so we still have a supply. I bought the stained glass from an eBay seller. All the other things you can find on eBay, at stained glass shops, or craft stores. You can also Google for mosaic supplies. We have bought large quantities from Wit's End, Mosaic Mercantile, and Maryland Mosaics. I really like your Frame that you have at the top. Where would you find most of your Material for your projects ? Thanks for your comment, sg1268! Yes, interpretating music through mosaic art is the most rewarding and most enjoyable thing I've ever done (artwise). I love this and have always wanted to do mosaics. I also find your interpretation of art and music very interesting. I am definitly starting a new hobby. Thanks for the inspiration! Alison and Whidbeywriter, thank you both for your kind words. Awesome hub and beautiful work. Thanks for sharing! Great Hub and beautiful artwork! :) Congrats on your hubnugget too!! This is an outstanding hub! Thank you for explaining mosaic art so thoroughly. Congratulations on the HubNugget nomination! elayne001 and ripplemaker, thank you both so much for your comments. Hi Silva, congratulations on your Hubnuggets Nomination. Don't forget to vote and promote your hub. The more votes, the merrier..and of course, the chances of being on the Hubpages newsletter is the big big gift to a writer! 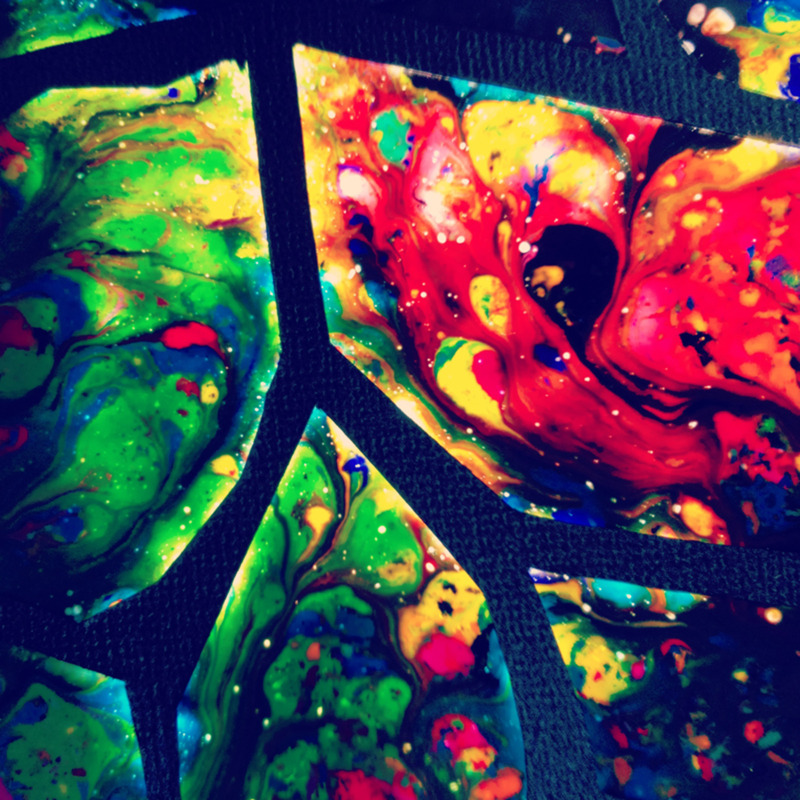 Have fun with with your mosaic art and the Hubnuggets! :) Such beautiful frames indeed. You make beautiful mosaics. Thanks for sharing how you do it. I'm sure it takes a lot of effort to come up with such beautiful frames. that was an awesome hub! Thanks, Denise and VioletSun! I didn't even know about the hubnugget nomination. How exciting! Beautiful! Thanks for sharing your tips; have voted for you in the hubnugget nomination! Maddie, any questions you have, email me at silvahayes@gmail.com and I will help you if I can. I hope you do try mosaics because it is so rewarding. Wow, excellent hub! Thanks for answering my request so thoroughly. I remember doing kiddie versions of mosaics with little squares of construction paper when I was a child. I'd like to try my hand at the grown-up kind, too, and you've given me a great place to start!